Russian President Vladimir Putin said in response to Hillary Clinton’s unproductive remarks comparing Putin to Hitler, he slapped her down saying that “it’s best not to argue with women.” Putin simply dismissed Hillary’s comments concerning Russia’s actions in Ukraine. 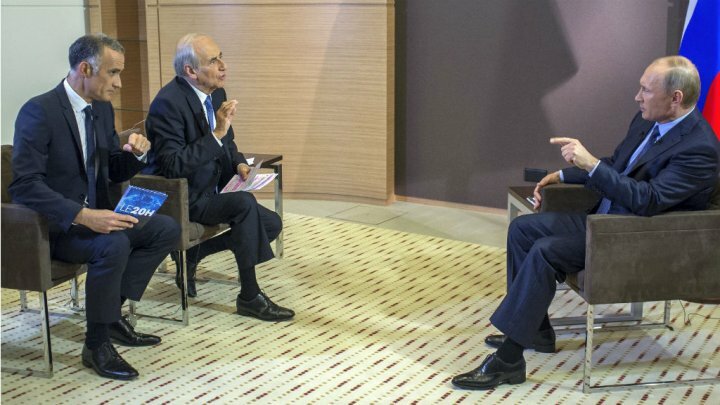 Putin’s remarks were made during an interview with France’s TF1 television and Europe 1 radio, during which he weighed in on a wide range of issues, including tensions over his country’s intervention in Ukraine. Hillary drew the parallel between Putin’s actions in Ukraine and Hitler’s Germany back in March after Russia began distributing passports to Ukrainian citizens. She then said: “Now if this sounds familiar, it’s what Hitler did back in the ‘30s.” What is disingenuous about this is that such actions are standard and the USA often cites defending its citizen abroad or the citizens of other nations against tyrants such as in Iraq and Syria. Putin correctly states the maxim in all relations. “When people go beyond certain boundaries of politeness, it demonstrates their weakness, not their strength,” he added “weakness, for a woman, is not necessarily a fault”. Putin continues to use the conspiracy crowd who were so eager to report Ukrainians were just idiots and it was all a grand manipulation by the CIA. Putin bluntly relies upon that nonsense stating the United States and Europe were instigating the crisis by backing an “anti-constitutional armed coup” against former president Viktor Yanukovich. He has support in that with all the people reporting just that propaganda without any inside knowledge of anything – just their eager speculation based upon that Russian propaganda. Hillary’s statements were simply US propaganda of half-truths as well in turn. Nevertheless, Hillary’s statements illustrate the trend in the new Cold War. It is strange that it is actually the Democrats who start wars and Republicans who end them. President Woodrow Wilson was a democrat and president 1913-1921. Franklin D. Roosevelt (1933-1945), and Lyndon B. Johnson (1963–1969). There we have the start of World War I, World War II, and Vietnam. Nevertheless, why the Obama Administration has been so hostile toward Russia even before Ukraine is very curious. In Russian polls, Americans are the most hated and Ukrainians come second.